When interest rates increase, so does the competition for CD dollars. 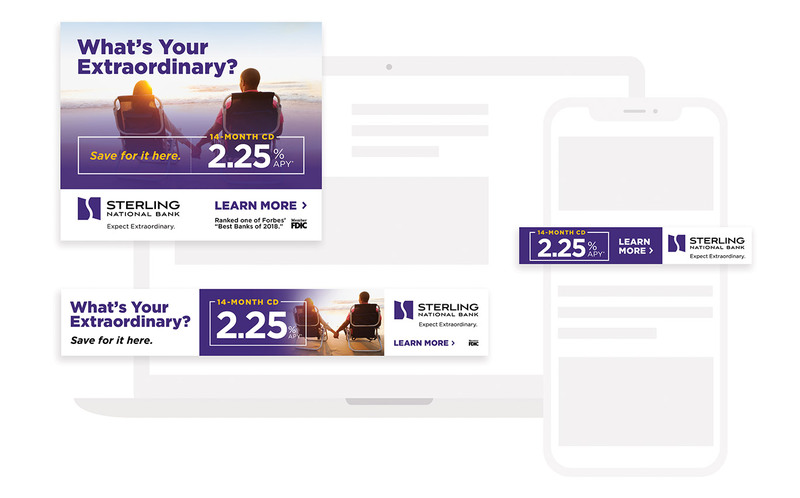 This integrated digital and print campaign for New York-based Sterling National Bank helped them compete with their better-known bank competitors in their new markets, delivered more than 3,400 qualified leads in six months and conversion rates far above industry standards. A mix of digital display and print ads used engaging lifestyle imagery and consumer-focused messaging to standout from competitors’ “rate box” approach and connect with targets. Paid search and digital remarketing banners target rate shoppers. Dynamic call tracking—technology that enables a website to dynamically display a unique phone number based on the referring source—allowed us to track every lead back to a particular source (organic, paid search, remarketing).